Infrastructure development in Qatar across different sectors owing to FIFA World Cup and 2022 and National Vision, 2030 has increased the demand for fire safety systems & equipment in the country. There has been growth in this industry in recent years and it is expected that the industry would witness vigorous growth over the coming years as well. According to 6Wresearch, Qatar fire safety systems and equipment market size is projected to grow at a CAGR of 6.2% during 2017-23. Construction projects costing around $92.98 billion which are to be undertaken by 2022, are consequently pushing up the demand for fire safety systems & equipment in Qatar. The demand for fire safety equipment, such as hose reel cabinets, sprinklers, smoke/heat detectors, extinguishers and others, is anticipated to increase due to FIFA world cup in the forecast period. Additionally, 9 new stadiums, 41 new hotels have to be built in Qatar by 2022, which would further spur the demand. Doha City accounted for the largest revenue share in the overall Qatar fire safety systems and equipment market share, followed by Mesaieed. It is expected that there would be an increase in the share of Doha City in the projected period due to major construction projects such as Doha Metro, Doha Convention Centre and Tower Project, Ali Fetaias Office Building, Darwish Residential Towers are being undertaken in the city. Qatar fire safety systems and equipment market report thoroughly covers the Qatar fire safety systems and equipment market by types, verticals and regions. Qatar fire safety systems and equipment market outlook report provides an unbiased and detailed analysis of the on-going Qatar fire safety systems and equipment market trends, opportunities high growth areas, market drivers which would help the stakeholders to device and align their market strategies according to the current and future market dynamics. • Historical Data of Qatar Fire Fighting Systems and Equipment Market Revenues for the Period 2014-2016. • Market Size & Forecast of Qatar Fire Fighting Systems and Equipment Market Revenues until 2023. • Historical Data of Qatar Fire Detection & Alarm Systems Market Revenues for the Period 2014-2016. • Market Size & Forecast of Qatar Fire Detection & Alarm Systems Market Revenues until 2023. • Historical Data of Qatar Fire Safety Systems and Equipment Market Revenues by Verticals for the Period 2014-2016. • Market Size & Forecast of Qatar Fire Safety Systems and Equipment Market Revenues by Verticals until 2023. • Historical Data of Qatar Fire Safety Systems and Equipment Market Revenues by Regions for the Period 2014-2016. 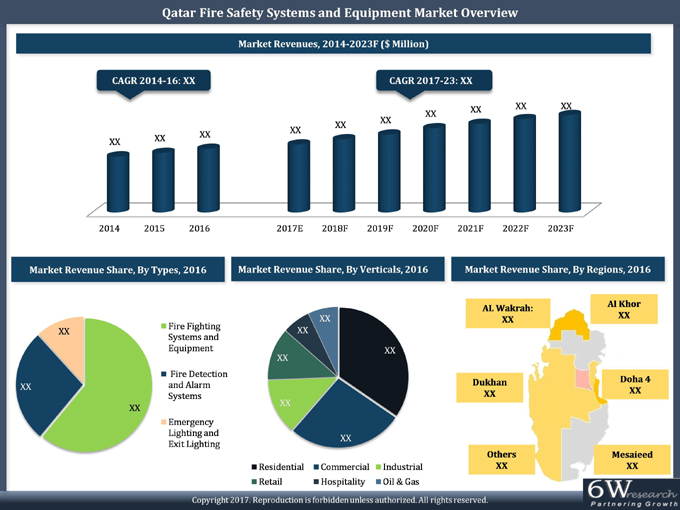 • Market Size & Forecast of Qatar Fire Safety Systems and Equipment Market Revenues by Regions until 2023. • Qatar Fire Safety Systems and Equipment Market Drivers and Restraints. • Qatar Fire Safety Systems and Equipment Market Trends and Developments. • Qatar Fire Safety Systems and Equipment Market Share, By Players. • Qatar Fire Safety Systems and Equipment Market Overview on Competitive Landscape. 15.1. Alpha Fire Services W.L.L. 15.2. Apex Fire Engineering & Trading EST.